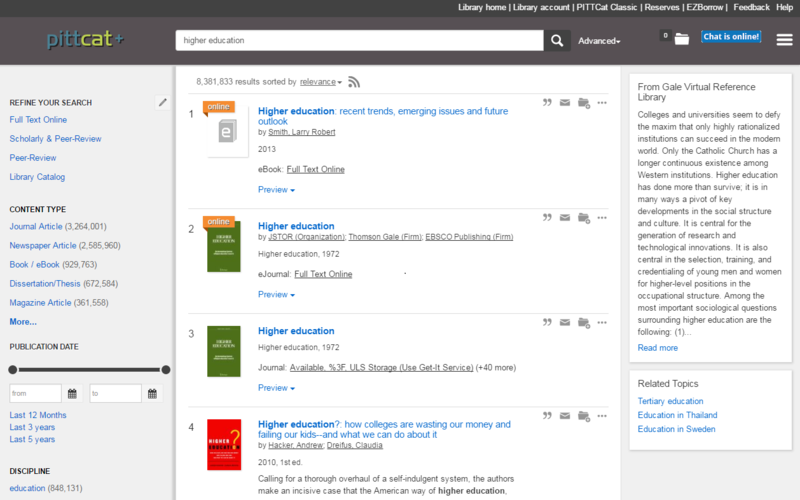 PITTCat+is the gateway searching tool for all of the materials owned by the University Library system (ULS), including articles, books, e-books, journals, e-journals, e-audio and e-video, digital images, government documents, microfilm and movies. To save a list of records, mouse-over the upper right corner of each record in the result list to activate the Save this item folder icon. Click on the folder icon to save items to the Saved Items folder that displays at the top of your screen. You can print, email, or export your selected records from this temporary folder. Use the export feature in the folder to save the items to your account in RefWorks, EndNote, or other citation management product. Combining Search Terms - You can craft complex searches using Boolean operators AND, OR, and NOT. These operators must be written in ALL CAPS. The PITTCat+ searching default is the AND operator. Phrase Searching - PITTCat+ allows for phrase searching with the use of “ “. For example, the search "pittsburgh renaissance" will find items with the phrase pittsburgh renaissance in them. Wildcard and Truncation – You can use wildcards (* and ?) symbols to search PITTCat+. PITTCat+ is the gateway searching tool for all of the materials owned by the University Library system (ULS), including articles, books, e-books, journals, e-journals, e-audio and e-video, digital images, government documents, microfilm and movies. Access PITTCat+ directly or use the ULS homepage. Enter your search terms and click on the Search Library button. PITTCat+ will offer correct spellings, and search for variations of our search terms. The Result List will include articles, books, e-materials, and images. Click on the title of an item for more detailed information about the item, such as an abstract or the shelf location for a book. If full-text content is available, you can get the full-text by clicking on the item title or the "full text online" link. You can Refine Your Results by using the options on the left. Narrow your results to items in the catalog, a specific campus, format, publication date, limiting to scholarly information, and more. If Full-Text Content is available, you can get the full-text by clicking on the item title or the "full text online" link. Enter your query in the text box and press enter or click Search Library. In the central panel, you will get search results, ranked by relevance. Click on a result for a full view with holding information. Add terms to narrow your search. Refine your search results by clicking on any term on the left to focus and narrow your results. Refine to by clicking on Items in the library catalog. Refine to your library by clicking it under Library Location. If we do not have a particular book, article or other resource in our collection, you can borrow it from another campus or local, national or worldwide library through our free interlibrary loan services. Use this to request a book from another Pitt library or Storage. After finding a book, click on the Get It! symbol in the catalog record, and fill out the form. Log in using your University Computing Account (email) username and password. Borrow an item from one of 70+ other regional libraries -- fast! You will need your Pitt ID number (starts with 2P) to use E-ZBorrow. If E-ZBorrow doesn’t have what you need, you can order a book or article through the Requests from Other Libraries page. Log in using your University Computing Account (email) username and password.